I promise, this is the last of the vacation picture posts…. So, remember a couple of posts ago I mentioned climbing up a rock structure after the Tech Sergeant? 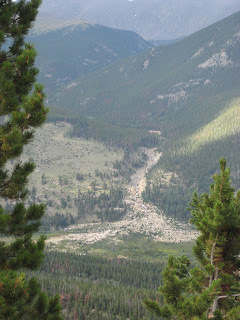 This would be what we were climbing. We did not do the entire structure, obviously, but you can see here why it’s called a fan. 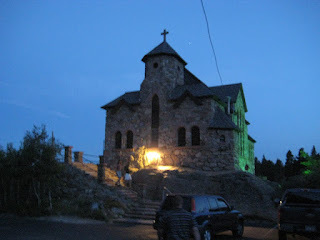 On the way home we stopped by a small church (St. Catherine of Siena) that seems to be rather secluded among the hills. A gorgeous structure though–my flash in the near dark doesn’t do it justice. Pope John Paul II stopped here one time. 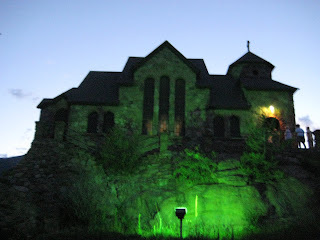 And for whatever reason my flash registered the light shining on the front of the church as green. It wasn’t quite this spooky (although…I enjoy the spooky nature of the photo). The church was surrounded by several little streams that all fed into a lake/marshy area. It was also built on an enormous boulder. It was quite a trip, filled with so much natural beauty that I don’t think one can fully comprehend without actually seeing it in person. But I hope the pictures give you some idea. I headed back Tuesday (after catching the Rockies vs. Giants game Monday and enjoying a hot dog at the very gorgeous stadium) and it’s back to library deadlines for me. I almost found my desk on Wednesday and hopefully by the time this posts I’ll be back towards “caught up.” Maybe.